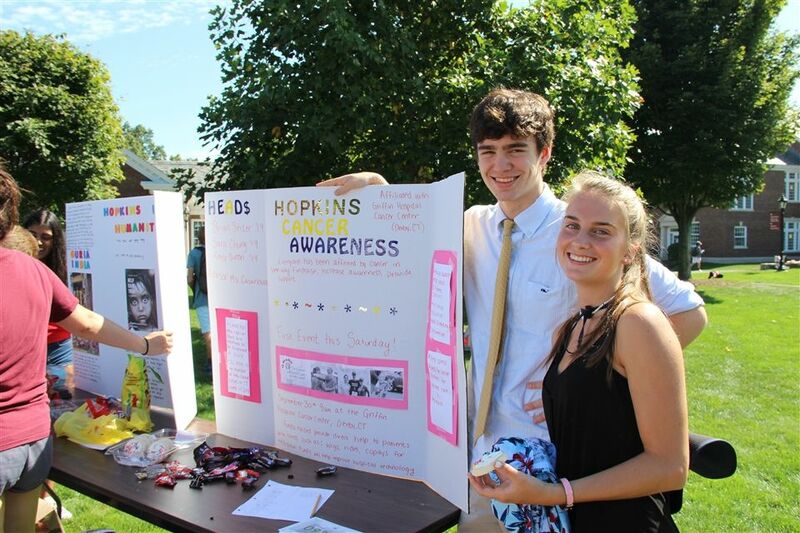 Brian Seiter ’19 and Kenly Burton ’19 advertise their club, Hopkins Cancer Awareness, at the fall Community Service Fair. 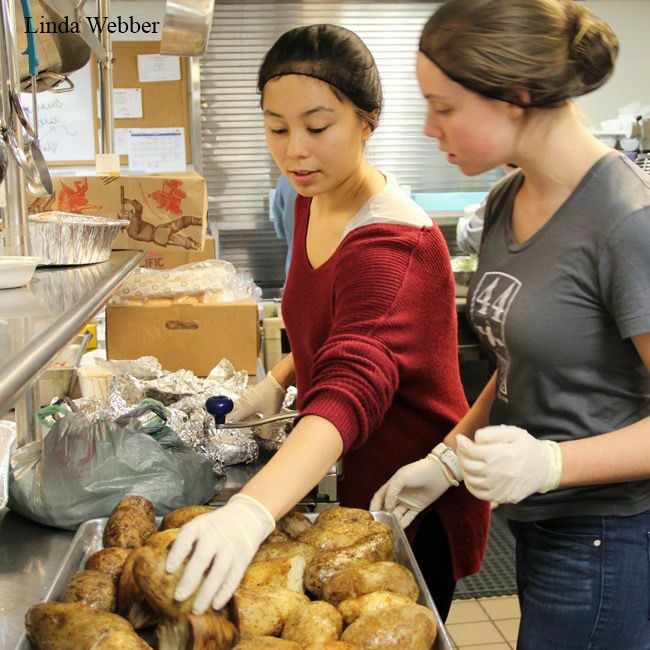 Hopkins students volunteer at Columbus House, serving chicken and potatoes to those at the shelter. Hopkins students from the Class of 2022 fundraise for the Connecticut Food Bank, an all-school community service endeavor, during the holiday season. Hopkins and Community Service. You must be thinking Canned Food Drive, right? You must know the statistics: that our record number is 2015 StuCo President Will Simon’s $97,069.27, that over the course of the past ten years, Hilltoppers have raised $679,528.68 during our annual fundraiser for the Food Bank; you must know that we’re the single largest donor to the CT Food Bank. Impressive, yes. Still this article isn’t about all that. Community service on The Hill is greater than even that awesome number and continues to be one of the prominent cultivators of the Hilltopper image. Our students run 34 Community Service Clubs ranging from Hopkins Cancer Awareness to Save the Elephants to Education for Children. This diversity is a source not only of pride, but also recognition for the diverse interest of service to which Hopkins students adhere. But community service isn’t all about the numbers. Community service is about the experience and takeaways of each individual and the continual effort to give more to the community around us. Community Service Director Alissa Davis builds off that statement discussing the significance of building a two-way service model, emphasizing the “benefits both for the person who is doing the work and the person who is receiving the work, where there is learning that happens for both sides.” Davis and other members of the Community Service Board are still crafting an official Hopkins Community Service Mission Statement. Malin ’18 emphasized that any small donation helps, whether temporal or monetary. While taking the time to meet the people you’re helping, students are “seeing the difference you are making, meeting the received all the funds that you’re raising and how that is helping people, that there are real people behind it that need what you are doing for them” is significant to the core of giving back to community, many Hilltoppers express that with already loaded academic and extracurricular commitments, it can be difficult to give up additional free time. For this, Seiter ’19 noted that, although “it can be tough to get out there and do hands-on activities,” there are always other ways one can help, whether baking or fundraising, any way possible. “We are the next generation. We’re going to be the adults, however scary that may be, and it’s our world that we’re going into. We all have a burden to give back to the society that has given so much to us. We’re at this great school, we’re at this great place and we should show that we’re thankful for that,” said Karyn Bartosic ’18. The call is out. It’s up to you.